The moment is alive, whether it is one of joy or of sorrow. When we are fully present to one another, the time shared is a form of communion. To be here now, is to be awake, it is a validation of the grand YES of our existence. 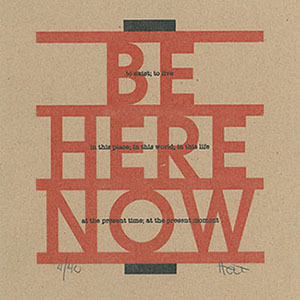 The notion of Be Here Now was first introduced to a wide audience in 1971 by Western-born yogi and spiritual teacher, Ram Dass,who details his transformation from Dr. Richard Alpert, PhD into Ram Dass, in a book by the same name. The cover features a mandala incorporating the title, a chair, and the word “remember”. The book influenced writers and yoga practitioners, and inspired the lyrics to George Harrison’s song “Be Here Now”, on his Living in the Material World album.